Did you all eat too much chocolate? Is there too much chocolate? We had a fairly quiet one, plenty of food, movie watching and of course indulging in easter chocolate. Up until Friday it was really busy here with one thing and another, so apart from doing my Granny A Day crochet squares I didn't get much crafting done. MrM helped me lay them all out on the lounge floor and we counted 90 all together. I've now stitched them together. 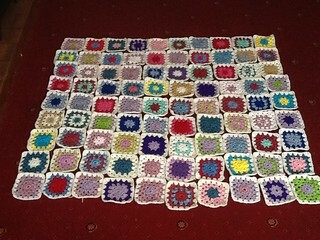 I need to add another couple of rows of squares & then I'll crochet an edge. 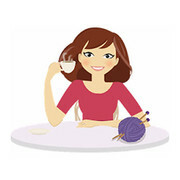 Once I've done that I'll show you my finished results. If you remember, last week's post was about the Spring Swap I was taking part in. Now my recipient has received her parcel and opened it I can reveal what I sent. My plan was to make my parcel as Spring like as possible. the weather here in England has been terrible with below freezing temparatures and snow instead of Spring like days. It even snowed on the first day of Spring, so instead of being out in the garden over easter, which was the original plan, we stayed in the warm and began hibernating again. You can see them to the right of the photograph. 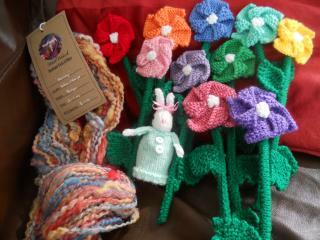 I love Frankie's designs as they're always colourful, bright, cheerful and easy to do. 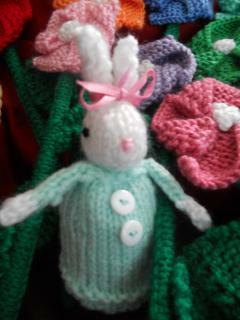 In the picture you can also see a knitted bunny. She holds a surprise though! She's actually an egg cosy! I added a chocolate egg under her dress as an extra special surprise. 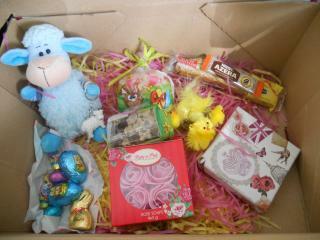 I also sent a blue teddy type sheep, some treats for my recipients dog, some easter chocolates. On the top right you can see a sachet of coffee as she's a huge coffee fan & I bought a Biscotti biscuit from our local cafe. The lady posted to say she was thrilled with her gifts, so all the worrying I did was completely unneccassary lol! My parcel arrived on the Wednesday and as we weren't allowed to open it until Saturday it was promptly confiscated to DD1's bedroom. But wow! once I opened it there were lots of oohs and ahhs at the contents. 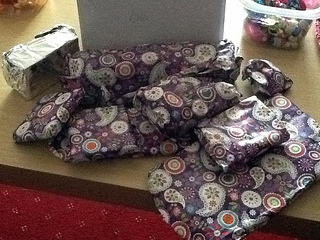 I opened the lid to find lots of little parcels covered in lovely purple paper. 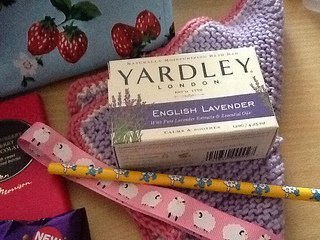 The parcel wrapped in silver foil was actually a bar of soap that smelt of Lavender! It is such a lovely spring smell! Underneath the soap you can see the hand knitted dishcloth. That smelt of Lavender too, and it's so soft to touch. I also recieved a pencil with pictures of sheep on, which will be used all the time as I'm old school and have to write down row counts etc on pencil & paper. Ive yet to find an app that I can get on with. I also had some cute ribbon with sheep on. I havent yet decided what to use it for, but it will definitely be used. As for chocolate treat, I opened 3 packages to find some chocolate with popping candy, that was great fun to eat! I felt 9 years old again lol! And also some luxurious dark chocolate which contained cranberries & raspberries. I love Dark chocolate & any berry fruit so that was a definite win! Some Cadburys bubbly chocolate too, which I havent eaten yet, but I'm sure it won't be long until that's been enjoyed! 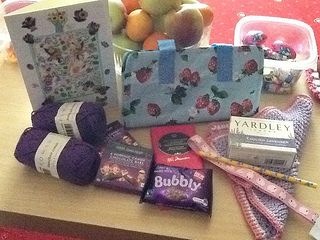 In the above picture you can see the lovely handmade card that was in the box, as well as a little bag. In a pretty blue with strawberries on. Ive already filled it with a crochet hook & some yarn & will be used when I go to the doctors, hospital or when visiting relatives. On the left you can see 2 little balls of yarn. This was infact to 50g balls of Rowans 100% cotton. Not sure what that will be made into just yet. But it will be something for me. So there you go, thats my adventurous weekend over Easter. the sun is actually shining here for once, so we've managed to get some washing outside & I can already hear MrM has the lawn mower out. So I'm going to put on my coat & join him outside for some sun.